The origins of the movement for a $15 minimum wage, the Fight for $15, began with a one-day strike in November 2012 by fast-food workers in New York City. After years of high-profile victories such as in Seattle, California and New York City, the movement is either becoming an international phenomenon or in its death throes depending on your point of view. The Massachusetts Legislature is considering raising the state’s minimum wage to $15. House bill No. 2365, sponsored by Worcester Rep. Daniel M. Donahue, and Senate bill No. 1004 seek an escalation of the minimum wage to $15 by 2021. Locally, Councilor at-large Khrystian E. King proposed a resolution calling for the City Council to support the Legislature’s efforts to raise the minimum wage to $15. The Council passed the resolution last night by a vote of 8-3. That the Worcester City Council does hereby support legislation (H.2365 and S. 1004) to create a statewide $15 per hour minimum wage for all workers in Massachusetts culminating in 2021. Objections to raising the minimum wage to $15 are numerous, but most often center around the premise that raising it reduces the number of jobs. Massachusetts and Washington currently have the highest minimum wage, $11 per hour. California ($10.50), Connecticut ($10.10), Arizona and Vermont ($10 each) also offer $10 per hour or more. 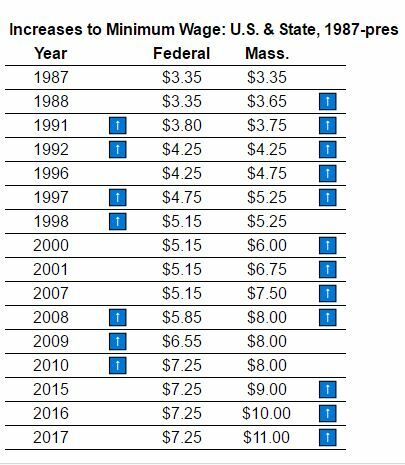 The federal minimum wage of $7.25 per hour has been unchanged since 2010. The Bay State has a history of leading the way on increasing the minimum wage. Beginning in 1988, the commonwealth has on nine occasions raised its minimum rate more than federal standard. Those increases took place in 1988, 1996, 1997, 2000, 2001, 2007, 2015, 2016 and 2017. If the theory that increasing the minimum wage costs jobs is correct, one would expect that in the years following those increases that the state would see higher unemployment or decreased labor force participation than the country at large. For the most part, it did not. 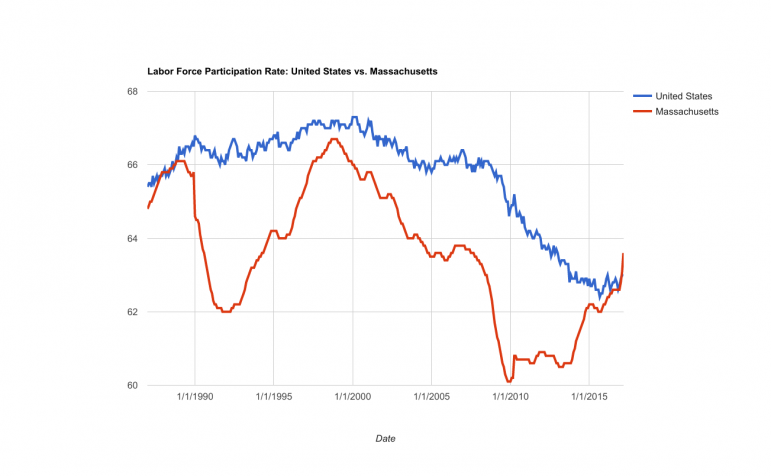 The Sun recently examined unemployment and labor force participation rates from 1987 to present for Massachusetts and the United States. We excluded the latest raise to the minimum wage, to $11 per hour on Jan. 1, for which complete data does not exist, and examined the 12 months following minimum wage increases that exceeded increases to the federal minimum wage. Only twice in eight years (1988 and 2001) did the state’s unemployment rate rise or rise faster than the national average. And only once in eight years (2001) did the state’s labor force participation rate decrease at a rate greater than the country as a whole. To be sure, the data does not speak to the nature of those jobs or numbers of hours worked. It neither supports nor refutes claims the increasing wages held back what would have been greater growth. Moreover, it remains true that increasing wages in the long run increases the economic incentive to automate jobs out of existence. However, to the central argument that increasing the minimum wage in Massachusetts decreases jobs, the evidence is clear: It does not. For this reason, we support Councilor King’s resolution and increasing the minimum wage to $15 per hour by 2021.